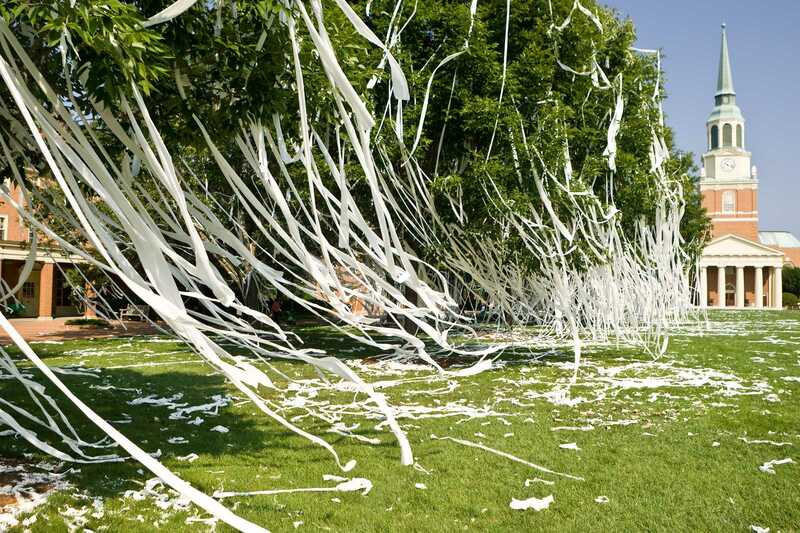 Over the weekend Wake Forest University decided that enough was enough – students needed to stop rolling the quad after every measly sports win. Initially, the university attempted to convince all athletes to transfer out of Wake Forest in hopes of earning fewer wins, however, the Deacs are still coming in with wins here and there, so an alternative had to be found. In an effort to “be more green” and to save toilet paper, the university sought this decision to halt all quad rolling activities. The thought: “no toilet paper, no problem” came to mind. If students can’t get their hands on toilet paper, they will no longer be able to cover the campus in it. Simple solution. However, students have become outraged by this — not so much because toilet paper is needed in the restroom — but instead because their “freedom of speech” is being stifled by the university’s lack of toilet paper. The university is actively making it nearly impossible for students to express themselves through rolling the quad. Students have not given up. One student has already started a GoFundMe page dedicated to “Wake Forest Rolling of the Quad Toilet Paper” in hopes of saving the campus tradition. Another student heard of the decision and hoarded as much toilet paper as humanly possible before it was removed from campus. The university has yet to comment on advice for students on what to use as a replacement for toilet paper when it comes to hygienic needs at this time. Becky is a senior from Atherton, California. She is a Business & Enterprise Management major with a minor in Entrepreneurship and Social Enterprise. Aside from her work on the Old Gold & Black, she is on the executive board of her sorority, Kappa Alpha Theta, serving as President. She has spent a summer in Sydney, Australia after her freshman year, and in London, England, after her sophomore year.